If you are looking for a very safe and effective antibacterial agent for your pet, Zeniquin may be the right solution. It treats bacteria through inhibiting DNA replication, and targets infections associated with bacteria susceptible to marbofloxacin (Zeniquin's primary ingredient). It is a broad-spectrum synthetic antibiotic approved for veterinary use in both dogs and cats. It is longer lasting than any other antibiotic of its class. It is specifically indicated for skin and soft tissue infections, as well as urinary tract infections and cystitis. Coated tablets are easy for your pet to swallow and once-daily administration makes giving your pet relief from his or her symptoms a simple task. The duration of treatment will depend on the cause of your pet's infection. Zeniquin is available in four different potencies, so you can cater to the size of your specific dog or cat. Sucralfate and antacids or foods and supplements containing iron, aluminum, calcium, magnesium and zinc can interfere with Zeniquin and should be avoided. 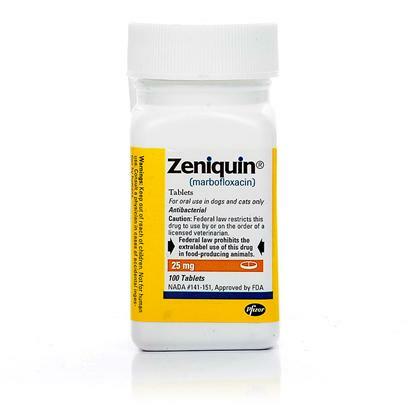 Do not use Zeniquin in cats less than 12 months of age. Use with caution in breeding, pregnant, or lactating animals. Should not be used in cats younger than 12 months of age or dogs during their rapid growth phase which can vary from 8-18 months based on the breed (small and medium breeds up to 8 months of age, large breeds up to 12 months of age and giant breeds up to 18 months of age). Use as directed by a veterinarian. Dosage is generally 1.25 mg/lb, and the duration of treatment depends on the cause of the infection; consult your veterinarian to determine the proper course of treatment for your pet.